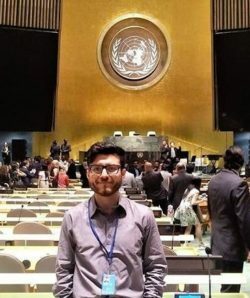 He received his Masters from The New School in May 2017 and is now interning with the United Nations Office of Genocide Prevention. He is part of the team that monitors countries around the world daily that the UN deems highly vulnerable to crimes against humanity, ethnic cleansing, and genocide. Kenny is currently working on reports on Venezuela, Dhahran, and the Persian Gulf. He came to International House in August 2015 and has found the experience an ideal one for his academic and professional pursuits. Kenny has been amazed by how motivated and committed people at I-House are in their careers and is certain many will become people in power in the future. “It’s good for networking,” he joked. He also enjoys going to into the Dining Room for lunch or dinner and being able to sit and talk to people from around the world that are politically engaged and interested in the works he does, though he admits it’s not the happiest of topics. Those meal time conversations have helped prepare him for his time at the UN, making him more informed via personal perspectives from I-House residents on what is happening around the world. “I really love that part of I-House. People are very open minded about discussions” he said. For Kenny, what makes I-House so special is the support he has received, both through financial aid to help fund his stay and personally. When his internship concludes in January 2018, he will return to Peru to peruse his diplomatic career, but he will miss New York City – “One of the most exciting cities in the world!” as well as the many friends he has made at I-House and the amazing conversations he’s able to partake in on a daily basis.